Pleasingly the playground looks interesting, with plenty of exciting features. When I see the playground in which I spent many hours of my childhood it’s more like a graveyard of ‘dangerous’ playground equipment, tarmac scars marking each piece’s passing. What makes the playground even better is the dual-use, not just for the school. While the school will have exclusive use during the school day, in the evenings, at weekends and during school holidays the playground will be available for the local community to use. Access will be through a new gate on Wickersley Road, meaning the main school site remains secure. 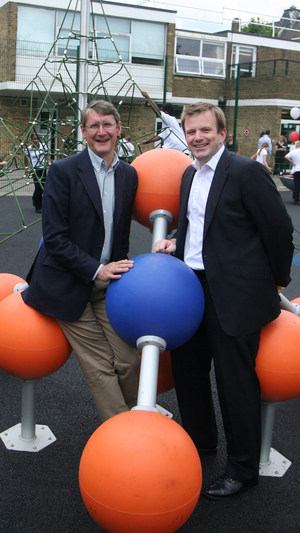 The playground, funded by Wandsworth Council to the tune of £105,000, is aimed at 5 to 12 year olds features a gyro, climbing wall, turbo slide, climbing rope net, spinning dish, balancing unit and a shelter with seats.